The Pierre shale underlies all of Rawlins County and crops out in many small areas along Beaver Creek, Little Beaver Creek, and North Fork Sappa Creek. The thickness of the Pierre shale underlying Rawlins County ranges from about 400 feet to about 1,200 feet, being thinnest in the southeast part of the county. Contours that show the topography of the Pierre shale surface have been plotted from test-hole data and are shown in Figure 7. The Pierre shale of northwestern Kansas has been studied in detail by Elias (1931). It consists of gray, blue-gray, and black clayey shale containing zones of abundant concretions, thin beds of bentonite, and crystals of gypsum. Elias divided the Pierre shale into five named members and one unnamed unit. The members are, in ascending order: Sharon Springs shale, Weskan shale, Lake Creek shale, Salt Grass shale, an unnamed shale member, and Beecher Island shale. Probably all members of the formation are present under Rawlins County except the Beecher Island shale and the upper part of the unnamed shale unit. The Pierre shale does not yield water to wells in Rawlins County, but acts as an impervious floor below the younger, water-bearing formations. Contact springs are common at outcrops of the Pierre shale because downward percolation of water is stopped by the impervious shale, and the water moves laterally along the contact until it is discharged at the outcrop. In northwestern Rawlins County, streams have eroded deeply into the Pierre shale. Analyses of water from wells (1-36-5dc) deriving supplies from alluvial or terrace deposits along these streams show high concentrations of dissolved solids because the water has been in prolonged contact with the Pierre shale. The Ogallala formation was named by Darton in 1899 (pp. 734, 735, 741-742, Pl. 84) from a locality in southwestern Nebraska. In 1920 Darton (p. 6) referred to the type locality as near Ogallala Station in western Nebraska. Elias (1931) made a study of the Ogallala formation in Wallace County and adjacent areas of western Kansas. In 1937 Elias described briefly the Ogallala formation in Rawlins and Decatur counties, and later (Elias, 1942) described fossil seeds and other plant remains from the Ogallala formation. Lugn (1939) presented a classification of the Tertiary formations of Nebraska in which he regarded the Ogallala as a group containing the following formations in ascending order: Valentine, Ash Hollow, Sydney gravel, and Kimball. The State Geological Survey of Kansas classes the Ogallala as a formation containing the Valentine, Ash Hollow, and Kimball members. These members of the Ogallala formation were not distinguished in Rawlins County. The Ogallala formation in Rawlins County consists of sand, gravel, silt, clay, sandy limestone, volcanic ash, quartzite, opal, and chert, and has a maximum known thickness of 246 feet (test hole 5-36-31cc). Poorly sorted sand and gravel containing silt and clay is the most common lithology in the Ogallala formation and beds of such material are found at nearly all stratigraphic positions within the formation. These deposits are generally cross-bedded (Pl. 4) and interfinger with beds of well-sorted fine sand. Sand and gravel deposits that are partly or completely cemented by calcium carbonate form benches or scarps (Pl. 5) where weathered and are known as "mortar beds," owing to their resemblance to mortar and because of their early use as natural mortar material. Plate 4--Uncemented sand and gravel, locally cross-bedded, in Ogallala Formation, NW sec. 11, T. 3. 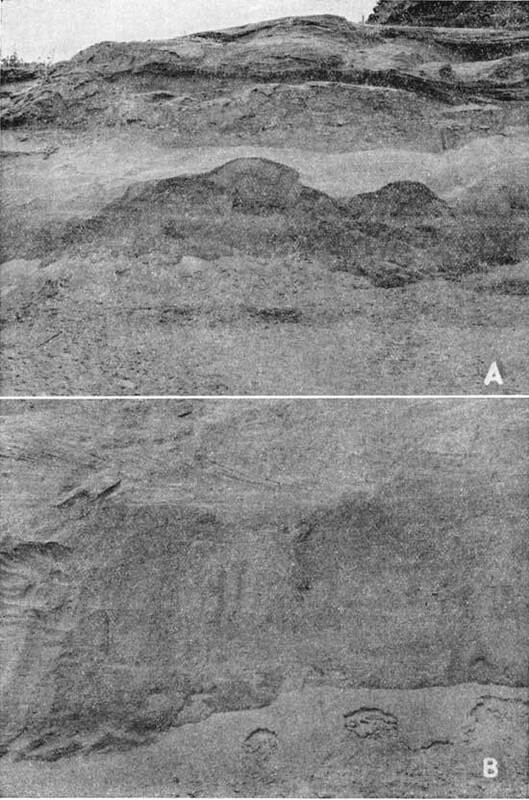 S., R. 33 W. A, General view of pit; B, Close view showing cross bedding. Plate 5--Mortar beds in Ogallala Formation. A, SW sec. 19, T. 2 S., R. 31 W.; B, C sec. 1, T. 5 S., R. 26 W.
Layers of silt and silty clay crop out throughout the county and were penetrated in many test holes. These beds are gray, brown, pink, and greenish-gray. A peculiar type of concentrically banded pink limestone, the "Algal limestone," marks the top of the Ogallala formation and crops out in the southwestern and north-central parts of the county. The average thickness of the "Algal limestone" in Rawlins County is about 18 inches. A bed of volcanic ash, identified as the Reager bed (Carey and others, 1952), is exposed in the W2 SW sec. 4, T. 4 S., R. 34 W. The Reager ash bed, which is about 2 feet thick at this locality, occurs near the middle of the Ash Hollow member of the Ogallala formation. Volcanic ash within the Ogallala formation also occurs in the NW NW sec. 33, T. 3 S., R. 34 W; the NE NW sec. 11, T. 3 S., R. 33 W.; the NE NE sec. 30, T. 4 S., R. 32 W., and the SE SE sec. 20, T. 5 S., R. 36 W.
The Ogallala formation in western Rawlins County contains irregular beds of white chert. The major constituents of the chert, according to Frye and Swineford (1946), are opal, chalcedony, and very fine grained crystalline calcium carbonate, with minor amounts of quartz and feldspar. The chert grades into almost pure opal within a short distance in some localities. Chert or chert and opal are exposed in the SE cor. sec. 9, T. 4 S., R. 36 W. (Pl. 6A); the SE SE sec. 34, T. 2 S., R. 36 W.; and at other localities in Rawlins County. The maximum thickness of chert observed in the county is about 12 feet. Plate 6--A, Opalized beds in Ogallala formation, SE sec. 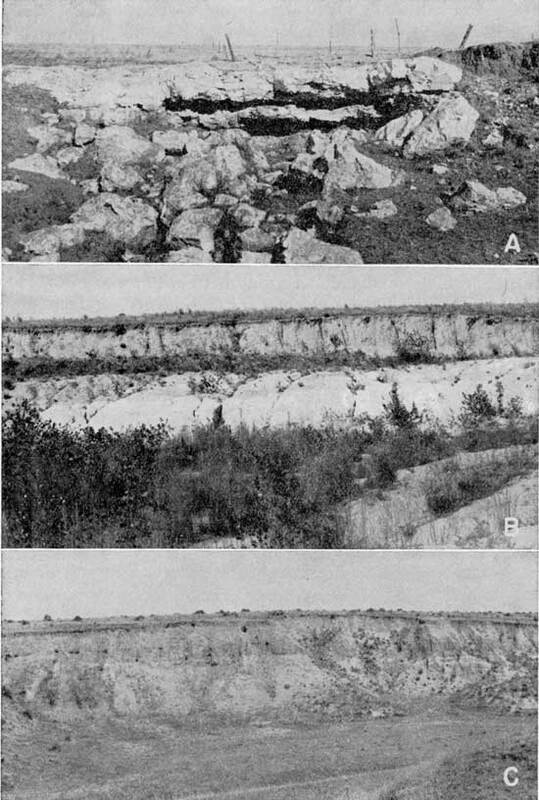 9, T. 4 S., R. 36 W.; B, Pearlette ash bed in Meade formation, SW sec. 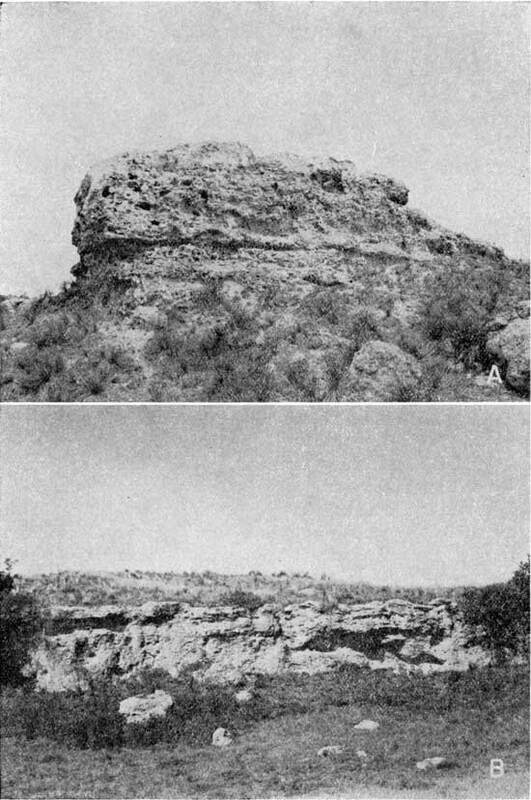 22, T. 3 S., R. 35 W.; C, Peoria silt member of Sanborn formation, overlying Ogallala formation, NW sec. 19, T. 2 S., R. 31 W.
Quartzite is present in the Ogallala formation in Rawlins County along the south side of Beaver Creek from the east county line to within a few miles east of Atwood, where the formation overlies the Pierre shale. The quartzite is light-green, generally contains many white feldspar grains, and is very hard. Most quartzite beds are lenticular, cross-bedded, and interbedded with loose green sand and clay. Very similar green sand and clay is exposed along South Fork Sappa Creek. The texture of the quartzite in the Ogallala formation ranges from fine-grained to conglomeratic. The thickness of the quartzite ranges from a feather edge to about 24 feet. Measured section in the Ogallala formation in the SE SE sec. 20, T. 5 S., R. 36 W. From the level of creek channel at concrete culvert. (Measured by John C. Frye and A. B. Leonard). Small quantities of sand and gravel from the Ogallala formation have been used locally for road-surfacing material and in concrete. Quartzite from quarries near Herndon and Ludell has been used locally for building stone, rip-rap, and road-surfacing material. "Mortar beds" of the Ogallala formation have been used in small amounts in Rawlins County for building stone, but are not altogether satisfactory for this purpose. Ogallala chert has not been used as an economic mineral resource in Rawlins County. The Ogallala formation is the principal source of ground water in Rawlins County and supplies moderate to large quantities of water to wells. All wells in the uplands as well as many springs that discharge at the contact between the Ogallala formation and the Pierre shale obtain their water from this formation. Although the permeability of the silt and clay beds within the formation is relatively low, the high permeability of uncemented sand and gravel beds and the great saturated thickness permit large yields of water from this formation. The municipal water supply for the city of McDonald and a large part of the domestic and stock supplies of the county are obtained from the Ogallala formation. No irrigation wells were known to be obtaining water from the Ogallala formation when the field work for this report was done. The chemical character of the water from the Ogallala formation is shown by analyses in Table 3 and a summary in Table 5, and by graphs in Figure 10. Water from the Ogallala formation has fairly uniform good quality regardless of location within the county. Pleistocene deposits in Rawlins County include the Meade formation, Sanborn formation, and undifferentiated low terrace and alluvial deposits. The Meade formation, as classified by the Kansas Geological Survey, is composed of a basal gravel member and an upper silt member. These members, the Grand Island and Sappa respectively, are equivalent to the Kansan age Grand Island and Sappa formations of the Nebraska Geological Survey. The Pearlette volcanic ash bed in the Sappa member has facilitated the correlation of Pleistocene deposits over a wide area of the mid-continent region. In Rawlins County only the Sappa member of the Meade formation was recognized. It consists of about 14 feet of volcanic ash (Pl. 6B), which is underlain by a small but undetermined thickness of silty clay and sand. The level of deposition of the Meade formation, which is considerably higher than the Crete sand and gravel member of the Sanborn formation, is locally marked by a fairly prominent dissected terrace level, but deposits of the Meade formation could be recognized only where Pearlette volcanic ash was present. The Meade formation is not mapped on Plate 1, but deposits of Pearlette volcanic ash are shown. Both of the known deposits of Pearlette volcanic ash in the county have been mined commercially on a small scale. Where observed, the Meade formation is above the water table and is not known to yield water to wells in Rawlins County. In the official classification of the Kansas Geological Survey (Frye and Leonard, 1952) the Sanborn formation includes, in ascending order, the following members: (1) Crete sand and gravel member; (2) Loveland silt member, commonly containing at its top the Sangamon buried soil; (3) unnamed early Wisconsinan alluvial deposits; (4) Peoria silt member; (5) unnamed late Wisconsinan alluvial deposits; and (6) Bignell silt member. The Sanborn formation of Kansas is unique in that it contains two unconformities and deposits of two stages. The Sanborn formation is retained in its present status by the Kansas Geological Survey because it is impracticable to differentiate between the silt members in ordinary field mapping. The name Sanborn formation was first proposed by Elias (1931) to replace the old terms "Tertiary marl" or "Plains marl." He referred to a locality in the northwest corner of Cheyenne County, Kansas, where the formation is well exposed. Sanborn is a small town in Nebraska, just north of the Cheyenne County locality. Crete sand and gravel member--In Rawlins County the Crete sand and gravel member of the Sanborn formation occurs as channel fillings of ancestral streams that in late Illinoian time flowed approximately parallel to and 40 to 60 feet higher than the present major streams in the county. The Crete sand and gravel member is well exposed in gravel pits in the SW sec. 12, T. 2 S., R. 32 W., and in the NE sec. 27, T. 3 S., R. 34 W. At these localities and elsewhere in the county, a thickness of at least 20 feet of sand and gravel is exposed. The sand and gravel grades upward into sandy silt of the Loveland silt member. Younger eolian silt mantles the terrace surface, resulting in a continuous slope down the valley side, so that an accurate determination of the terrace width is impossible without extensive test drilling. Measured section of the Crete sand and gravel and Loveland silt members of the Sanborn formation in the SE sec. 12, T. 2 S., R. 32 W.
The Crete sand and gravel member of the Sanborn formation yields moderate to large quantities of water to wells in the county. Municipal wells at Herndon and Atwood obtain water from the Crete sand and gravel member. Several irrigation wells in the county also obtain water from this member. Loveland silt member--In Rawlins County the Loveland silt member of the Sanborn formation overlies the Crete sand and gravel member adjacent to the major streams and rests directly upon the Ogallala formation in the uplands. Where the Loveland silt member overlies the Crete sand and gravel member, the contact is gradational and the deposits should be classed as Crete-Loveland. The Loveland silt member in upland positions is composed of massive, well-sorted, eolian silt. It is calcareous except in the upper part and is tan to reddish-brown. The top of the Loveland silt member is in many places marked by a prominent Sangamon soil, which is leached of calcium carbonate and has a blocky texture. The thickness of the Loveland silt member over most of Rawlins County is less than 20 feet, but one test hole (3-32-31bc) penetrated 42 feet of Loveland. Alluvial phases of the Loveland silt member are present in the valley area of the county, but are not mapped with the Sanborn formation on Plate 1. Nearly everywhere in Rawlins County the Loveland member is above the water table and does not yield water to wells. Peoria silt member--The Peoria silt member of the Sanborn formation lies at the surf ace of most of the flat upland areas of the county and extends down to and mantles Crete terraces along the major streams. The Peoria silt member (Pl. 6C) is composed of massive eolian silt, tan to light-yellow, containing fossil snails. At localities where the Peoria silt member is overlain by Bignell loess, the top of the Peoria silt member is marked by the buried Brady soil. The thickness of the Peoria silt member in Rawlins County is commonly about 35 to 55 feet. Thicknesses as great as 80 feet were penetrated in some test holes. Alluvial phases of the Peoria silt member are present in the valley areas of the county, but are not mapped with the Sanborn formation on Plate 1. The Peoria silt member is above the water table in Rawlins County and does not yield water to wells. Bignell silt member--The Bignell silt member of the Sanborn formation is recognized overlying the Peoria silt member in a few localities in Rawlins County. The Bignell silt member is similar in lithology to the Peoria silt member and can be recognized in mapping only where the Brady soil is developed on the Peoria silt member. The thickness of the Bignell silt member does not exceed a few feet in Rawlins County, and the member does not yield water to wells. Alluvial phases of the Bignell silt member are present in the valley areas of the county, but are not mapped with the Sanborn formation on Plate 1. Alluvial deposits occur in the bottoms of the stream valleys and in low terrace positions along many of the major valleys. The low terrace deposits, which are Wisconsinan and Recent in age, and the Recent alluvium are nearly identical in lithology and are mapped together on Plate 1. The material in the upper part of the alluvium and low terraces is fine grained, being derived chiefly from the Sanborn formation. The lower part, especially along the major streams that are cut deep into the Ogallala formation, is composed of sand and gravel derived from the Ogallala. The known maximum thickness of these deposits is about 50 feet. Alluvium and low terrace deposits resting on Pierre shale furnish moderate to large quantities of water to wells in eastern and central Rawlins County. In western Rawlins County the deposits overlie the Ogallala formation and except during rainy periods are not entirely saturated, and wells are generally extended into the Ogallala formation to get adequate water supplies. Deposits along East Fork Burntwood creek are very fine grained and furnish only small quantities of water. The chemical character of the water from alluvium and terrace deposits is shown by analyses in Table 3 and a summary in table 5, and by graphs in Figure 10. Water from terrace deposits has higher concentrations of dissolved solids than that from the Ogallala formation. These higher concentrations are primarily the result of solution of calcium carbonate and sulfates, and they are believed to be in part due to the influence of the underlying Pierre shale. Higher evapotranspiration rates in the valleys may also contribute to the higher concentration.